While Samsung was announcing its Galaxy Gear smartwatch yesterday, Qualcomm was busy announcing its own smartwatch, called the Toq. Pronounced as “talk”, the Qualcomm Toq pairs with your existing Android smartphone and brings all your notifications where you can see them at a glance. The main feature of the Qualcomm Toq is the unique Mirasol display. Developed by Qualcomm, Mirasol is a type of interferometric modulator display that works without the need of a backlight. Just like e-paper displays, Mirasol displays can stay on constantly without requiring power and are perfectly visible even under bright sunlight. But Mirasol goes one step ahead of current e-paper displays and is capable of displaying full color and it also uses the ambient light as a backlight, thus significantly reducing the power consumption. While Samsung claimed a battery life of around 25 hours for the Galaxy Gear, the Mirasol display on the Qualcomm Toq allows it to run for around three days on a single charge. The Qualcomm Toq pairs with your Android smartphone (requires Android 4.0.3 and above) and pulls your notifications, while also letting you pick up calls, read messages, control music, etc. The Toq uses a buttonless design and relies completely on the display for interaction. Qualcomm also has an optional pair of wireless Bluetooth headset that works with the Toq. The headset has two speaker modules that plug into each ear with no wires connecting them. 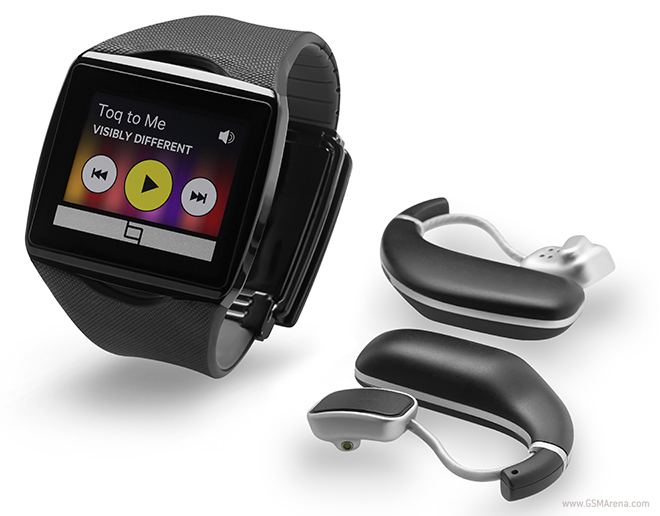 They pair with the watch and you can answer calls and listen to music on them and control them through the watch. Both the Toq and the wireless headset supports wireless charging, To charge the watch, simply place it in its case. The case also has provision to charge the headset so you don’t need additional chargers. The Qualcomm Toq is expected to go on sale in the middle of next month and will sell for around $300.